Free convert (protected) DVD to MP4 (MPEG/H.264) on Mac (iMac, MacBook Pro/Air, etc.) 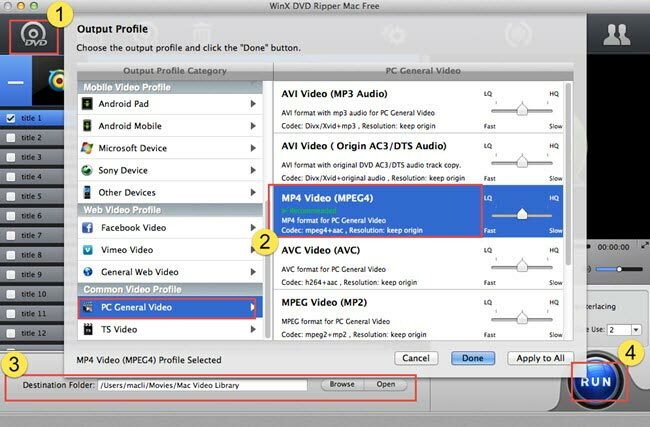 can be easily achieved with 2019 best free DVD to MP4 converter for Mac (macOS Mojave). Seek help from a free DVD to MP4 converter for Mac to convert DVD to MP4 video for free on macOS Mojave/High Sierra/El Capitan? Is there a top recommended free DVD converter for Mac to rip purchased/rented copy-protected DVD to MP4 efficiently? I want to convert a collection of latest bought new DVDs incl. the popular Manchester by the Sea DVD to my MacBook Pro for playing on my upcoming trip to New Zealand. A truly feasible new protected DVD rip solution is badly needed now. Those free DVD to MP4 rippers Mac which allege that they can rip any protected DVD to MP4 with original quality but are tested with an extremely poor/blocked output video that is even barely to watch are not recommended to me please. A professional free DVD to MP4 converter for Mac (Mojave/High Sierra) enables users to flawlessly rip (protected) DVD to MP4 (MPEG/H.264) fast and smoothly by outputting highest quality. Easily rip DVD to Mac general video MP4, MOV, M4V; PC general video MP4, AVI; YouTube FLV, Facebook and other general Web videos at superfast speed. WinX DVD Ripper Mac Free, best free DVD ripper for Mac, is focusing on helping users to rip protected DVD to MP4 (MPEG/H.264) for free on all Mac platforms, including macOS Sierra. Most people use this smart program to easily free convert many popular DVD movies with copy protections to MP4 for easier playback on the move. Supported OS: macOS Mojave, (High) Sierra, Mac OS X El Capitan/Yosemite/Mavericks, etc. Output: Mac general video (MP4, MOV, M4V), PC general video (MP4, MPEG, AVI), iTunes (MP4, H.264), YouTube video (MP4, FLV), music (MP3, AAC, AC3), image (PNG), device profiles (iPhone, iPad, Android, Sony, Microsoft), etc. 1. Convert almost all copy-protected DVDs to MP4 for free on Mac by supporting all DVD protections except Disney X-project DRM. 2. Practical video editing features like splitting a part of DVD movie video to rip by setting Start/End time. 3. Advanced video/audio parameter settings enable you to freely change video resolution, frame rate, aspect ratio, etc. to get expected output effect. 4. Exclusive "High Quality Engine" and Hyper-threading technology ensure a decent output quality with a superfast DVD to MP4 free ripping on Mac. Here taking converting Manchester by the Sea DVD to MP4 as example to teach you how to easily rip DVD to MP4 (MPEG/H.264) on Mac (macOS Mojave/High Sierra) for free, so as to play DVD movie on MacBook Pro/Air, iMac, iPhone XS/XS Max/XR, iPad Pro 2/Air 2, Samsung Galaxy S9/Note 8, etc. with ease. First of all, free download and install the top-notch free DVD to MP4 converter for Mac on macOS Mojave/High Sierra/El Capitan computer, etc. Step 1: Load the DVD movie into the best free DVD converter for Mac. Put the Manchester by the Sea DVD into the DVD-ROM. Open the software WinX DVD Ripper Mac Free, then click "DVD" button on its top-left corner to load the detailed DVD information. DVD folder and ISO image file input options are also provided next to it. One of most distinguishable advantage of this best free DVD to MP4 ripper Mac is it can auto check the right DVD main title for you which the free Handbrake can't do. Step 2: Choose MP4 (MPEG4/H264) as the target output. In the auto pop-up Output Profile window, click PC General Video --> MP4 Video. Then tap "Done". Before beginning to free convert DVD to MP4 on Mac, you can click "Edit" icon to crop, trim, expand the DVD movie video, or add external SRT subtitles to it; or click the wheel-like icon to open the video/audio parameter settings window to make free adjustments to get desired output effects for the MP4 video. Step 3: Start converting DVD to MP4 file for free. Click "Browse" button on the bottom to choose a preferred destination folder to save the ripped DVD movie video. Then tap "RUN" button to start ripping Manchester by the Sea DVD to MP4 video for free without losing quality on Mac (macOS Mojave/High Sierra) with the best free DVD to MP4 converter for Mac. After the ripping, then you can use WinX MediaTrans to transfer the MP4 video to iPhone iPad for watching whenever and wherever you want. 1. Use "Safe Mode" to steer away all hitches if you meet problem in free ripping copy protected DVD. 2. Maximize the DVD conversion speed by choosing CPU Core use (utmost 8). 3. Tick "High Quality Engine" or "Keep Origin" to output best video quality. 4. For ripping Disney protected DVD to MP4, please turn to its upgrade version WinX DVD Ripper for Mac which supports accessing Disney DVD copy protection. It supports CSS, UOP, RCE, region code and Sony ARccOS protected DVDs, helping rip Disney DVD to MP4, as well as AVI, MKV, iPhone, iPad Pro and other hundreds of video formats, device profiles at accelerated speed. WinX DVD Ripper Mac Free is the best answer. Free convert and rip DVDs to MP4, Free DVD to MPEG, Free DVD to iTunes, Free DVD to MOV, Free DVD to FLV. Review of Top 5 Free DVD Rippers for macOS Mojave, High Sierra etc.